The MWC kicked off a day early for Samsung. The company held a press event at Palau Sant Jordi hall in Barcelona, introducing the I9100 Galaxy S II smartphone and Galaxy Tab 10.1 tablet. Understandably, given the popularity of the Galaxy S lineup, Samsung tried to focus most of the attention on the I9100 Galaxy S II droid. The slim smartphone packs a huge 4.3” Super AMOLED Plus screen, which should represent a significant update even over the already great Super AMOLED unit on the first Galaxy S.
The speakers went on and on about the Samsung Galaxy S II dual-core processing prowess, powerful GPU and the four hubs that should take the user experience another step forward. Now we are not sure if those hubs will matter that much to potential customers, but we do believe that this will be one of the best smartphones of the year. Samsung came up with an innovative way of illustrating the Galaxy S II functionality. They told the story of four imaginary users and how the Galaxy S II helps make their lives better. You can check out that part of the presentation in the video below. The Galaxy Tab 10.1 announcement came with less fanfare, but make no mistake – the tablet is one of the most capable in its class. 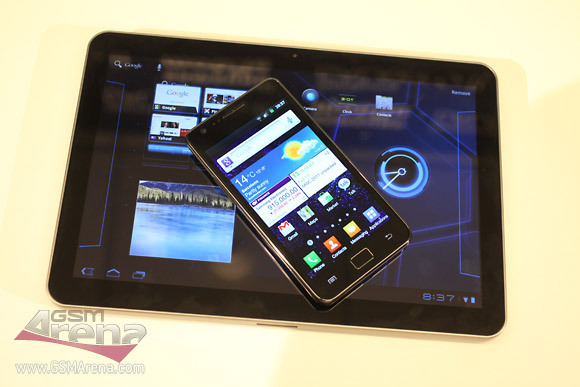 You get Android 3.0 Honeycomb and Tegra 2 on the inside and a 10.9mm thin shell, weighing a mere 600g on the outside. Once the press conference was over we got the chance to spend some quality time with the two Android devices. Join us after the break for live photos of the Galaxy S II and Galaxy Tab 10.1 garnished with our first impressions.